You will find us in South East Essex in one of the suburbs of Southend-on-Sea. There are two main road routes into Southend via the A13 and A127 or the rail link from London Fenchurch Street to Westcliff or Chalkwell Stations. 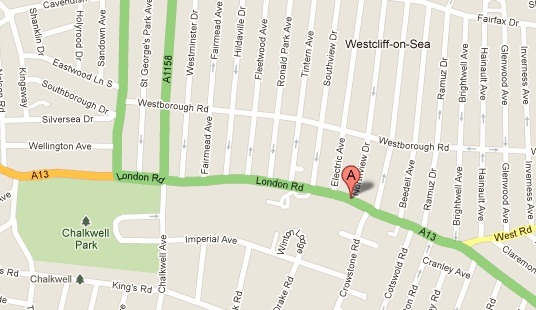 Our postcode is SS0 9HS if you are using SatNav. You will find us along the south side of the London Road (A13) in Westcliff-on-Sea in between the BP Petrol Station and Jewsons opposite Southview Drive. Our building is situated behind ‘Churchgate’ flats and there is a carpark entrance from the London Road; we have a good sized carpark, and lots more parking is available on London Road and in the surrounding streets.